These are not conventional private classical piano lessons, in that their principal emphasis is not on learning to play correctly classical pieces written out note-for-note in absolute pitch standard stave notation. 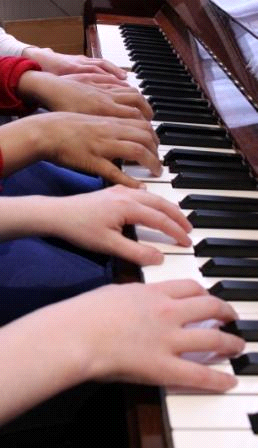 Rather, their emphasis is on continuing the style and methods of the Stepping Notes classes for 2s to 8s (singing, movement, solfa, relative notation and chord symbols, scale and harmonic analysis), but gradually applying these tools to the piano. These classes will happen weekly, at my home in Shepperton. I recommend 35-minute sessions if there are two children in the group, or 45-minute sessions if there are three in the group. Individual lessons are also available. 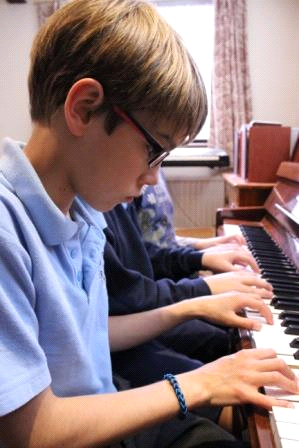 Consistent regular attendance at lessons will be essential, and practical homework tasks and practice will be set weekly which will require consistent, daily work at the piano. Your child is still young, and to progress well will need your (the parent’s) patient, consistent and informed involvement in his/her work. Therefore you, the parent, will need to ensure your own close familiarity with what is being covered in lessons. (If you decide to share with other parents the task of bringing the children, please make sure that whoever comes with the children can pass on all the necessary information to the other parents in the group, or make the necessary notes in the other children’s practice books.) You will, of course, need an acoustic piano (i.e. not an electronic keyboard or synthesiser or digital piano or clavinova etc.) at home to practise on, and it will need to be tuned every six months or so. I can give you advice on this if you need it. Nikhil Dally received first-class honours in music from Cambridge University, and studied composition at the Guildhall School of Music. As a pianist, Nikhil specialises in accompaniment and music theatre. He has performed in shows directed by Mike Leigh, Arnold Wesker, Keith Warner and Mehmet Ergen. He has performed at the Kings Head Theatre, the Arcola Theatre, Pizza on the Park, the Pheasantry, and the Assembly Rooms in Edinburgh. He has worked for the Orange Tree Theatre, National Youth Music Theatre, Proteus Theatre Company and Re:creation Theatre Company. He founded the Stepping Notes Music School in 1999. He is a member of the Incorporated Society of Musicians, the UK’s professional body for musicians and music teachers.